ick Riordan is the author of the Percy Jackson & the Olympians series, the Kane Chronicles, and The Heroes of Olympus series. The Percy Jackson series is about Greek gods, goddesses and their half-blood children. Half-bloods, or demigods, are the offspring of a god or goddess and a human. The children are usually gifted in some way, depending on who their Greek parent is. The main characters in this series are Percy Jackson, Annabeth Chase, and Grover. Percy’s dad is Poseidon, god of the sea. Annabeth is a daughter of Athena, goddess of wisdom. Grover, charged with protecting demigods, is a satyr with the torso of a human and legs of a goat. Percy is more powerful than other demigods; he is able to control water, talk to marine life and horses, and breathe underwater. But because he is more powerful, he is also more enticing to monsters like Gorgons, minotaurs and the Furies. Because demigods are always in danger of monsters seeking them out, they go to Camp Half-Blood for protection and instruction on how to survive. This series follows Percy and his friends as they go on numerous adventures to save the camp, save the world, save other demigods, and complete (or stop) a prophecy from fulfillment. The books are thrilling, the characters are easy to become attached to, and Riordan has won all sorts of awards for this series. In fact, the series was so popular that there was a movie made for the first book, The Lightning Thief. I was wary to start The Heroes of Olympus series in case it couldn’t measure up. It still follows Percy and Annabeth, but now there are new friends, more dangers and a whole other camp. I shouldn’t have been worried. Riordan is still an amazing writer, and this series is just as easy to obsess over. 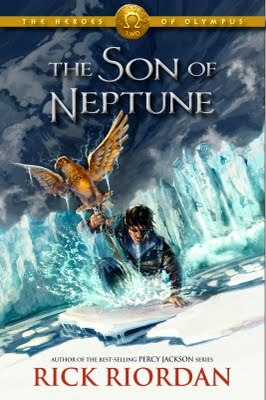 In The Son of Neptune, Percy has lost his memory and has stumbled across a Roman camp for demigods while escaping three Gorgons, who happen to be the sisters of Medusa. While at this Roman camp, Percy is temporarily accepted as a new recruit and meets two new friends, Hazel and Frank. Hazel has just recently come back from a 70-year stint in the Underworld, and Frank is hiding a dangerous secret. The story plot itself is pretty typical of this series. A vague prophecy sends the heroes on a quest, and the only thing that they know for certain is that failing would mean the end of the world as they know it. There is plenty of mystery since each character has a secret; Hazel is cursed, and Frank is more than he seems. They must learn to trust each other in order to save the world. Despite the sometimes childish conclusions to the fights, I really enjoyed this book. Riordan manages to weave in smaller mysteries throughout the journey to the final fight, which keeps readers interested and entertained. There is a wonderful balance between seriousness and humor; it’s never too dull or too silly. It was nice to get back into the life of a beloved character and cheer them on as they take on the world.